In Edo, players represent daimyo in mid-second millennium Japan who are trying to serve their shogun by using their samurai to construct castles, markets and houses in Tokyo and surrounding areas. At the start of Edo – which won "best evening-length game" in the 2010 Hippodice Game Design competition under the name Altiplano – each player has five samurai tokens, seven houses, one market and three square action cards, each of which has four possible actions on it. Each turn, the players simultaneously choose which actions they want to take with their three cards and in which order, programming those actions on their player cards. Players then take actions in turn order, moving samurai on the board as needed in order to complete actions (to the forest for wood, the rice fields for rice, cities to build, and so on). Building in cities costs resources and gives you points as well as money; as more players build in a city, the funds are split among all present, with those first in the city receiving a larger share. Players can also receive points or buy stone by dealing with a traveling merchant, whose offerings change from turn to turn. In Edo, you are a Daimyo, trying to develop Edo and its surrounding area. You do this by building houses, trading posts and castles. Throughout the game you earn power points (VPs), for the building and trading, for money and for each samurai on the board and the player with the most Power Points (PPs) wins. There is one catch however, if a player has not built at least one house in Edo, they cannot win no matter how many PPs they have! 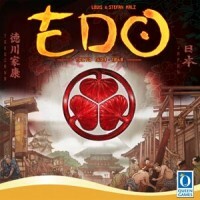 Edo is played over several rounds and each round consists of 4 phases. In phase 1 you will select the 3 actions you will be taking this round. Each player starts the game with 3 Authorization Cards (you may acquire more are the game progresses), each of which shows 4 possible actions. You will place 3 of these into you planning board and whatever action is at the bottom is the action you will be taking. Some of these actions can be taken more than once so you then need to assign 1 official for each time you plan on taking the selected action. Some of the actions also require that you have a samurai on the board in ADDITION to the official on the action. For example, to collect a resource you need to have an official on the selected action and a samurai already on a location on a specific location on the board. In phase 2 you will perform the selected actions. Starting with the first player and moving clockwise, each player will reveal and perform all the activations their first chosen action. Then each player will do the same for their second and finally their third action. The actions do things like gather resources or money, place samurai on the board, move samurai on the board, build buildings, etc. I am not going over all the actions in detail, but one action needs to be covered a little. The Trading Actions allows you to exchange resources for PPs and to obtain resources for money. Both of these are dictated by the Merchant card for that round. When you reveal the trading action you can move the merchant piece on the board. Normally when you take this action you can choose one of the 2 options on the merchant card (either gains resources or gain PP’s) but if your samurai and the merchant are in the city where you built your trading post you can do both. In Phase 3 each player’s will collect wages and income. In starting with the first playing and going clockwise, each player must decide whether or not they will keep their samurai on the board. For each one remaining the player must pay 1 rice to the supply. The each city with building will supply income (money). The amount depends on the number of players who have buildings there and how much total Influence (determined by the amount and type of buildings owned) each player has. The player with the most influence receives the largest portion, the player with the second most influence will receive the second most, and so on. In phase 4 you will check for end game (1 or more players has 12+ PPs or the merchant card deck is exhausted. If neither condition has been met, then the merchant Card is updated, officials & authorization cards come off the planning board and the first player passes. If the end game occurs then a final scoring occurs and you check to see if any player has not built in Edo (if so this player is eliminated). Each player will gain 1 additional PP for each samurai they have on the board and 1 PP for each 50 Ryo they have left and the player with the most PPs wins. Ties are broken with the most remaining resources. I like Edo quite a bit. The theme is not really strong, but it is there. 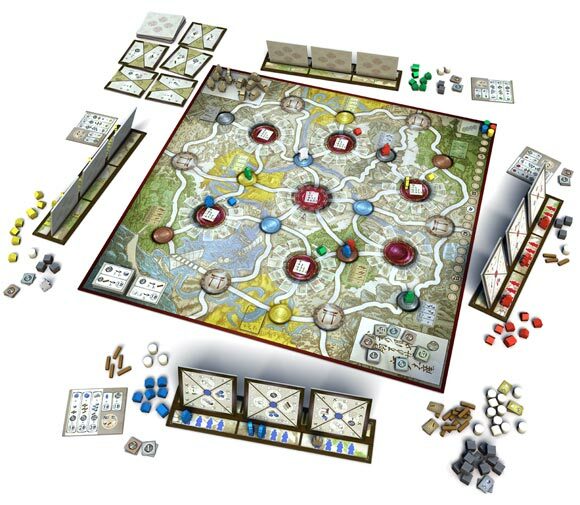 The game has many familiar mechanics but the unique mechanic of having to have workers in 2 different locations (officials of the planning board and samurai on the board) in order to carry out an action gives the game a new feel. Lots of tough decisions and it is a very tight game. Add a Review for "Edo"